You may have already seen the best part of the pilot episode of the sitcom Jalen vs. Everybody. The clip, which surfaced earlier this week, featured a fictional meeting between Jalen Rose and Kobe Bryant. It’s a good scene. Jalen Rose makes a funny face, he acts pretty well as a man pretending to be happy to see someone, Bryant gets to play off his hyper-competitive image and even the waiter gets a good line in. Well done. 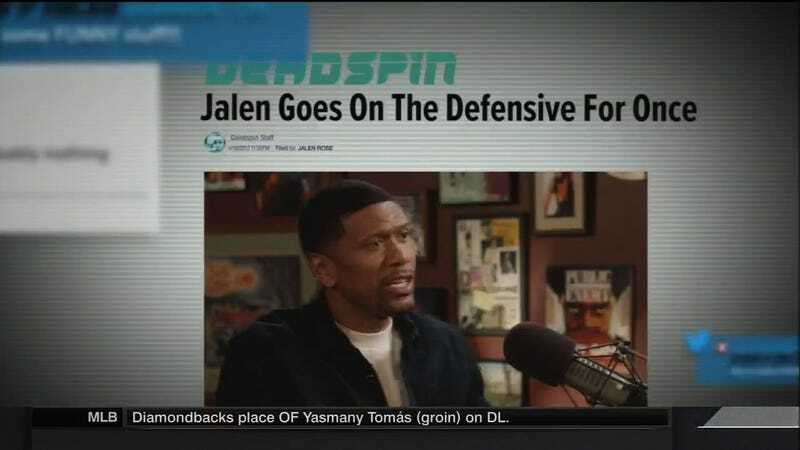 The clip went viral this week without much of an explanation, but it was actually the credits clip for the pilot episode of Jalen vs. Everybody. The pilot, written by Fresh Off the Boat creator Nahnatchka Khan and produced by ABC and 20th Century Fox Television, didn’t get picked up. But ESPN decided to air it last night. It was odd, because ESPN was airing a fictionalized version of itself on ESPN. Yes, ESPN has done this for years with the “This Is Sportscenter” commercials. But those are 30-second skits. It’s weird to broadcast an episode where a fictionalized Jalen Rose and his fictionalized show’s fictionalized partner, fictionalized David Jacoby, fret about losing their fictionalized jobs so soon after real ESPN went through a set of real layoffs. It’s also confusing because the real ESPN ticker is at the bottom broadcasting real news. When I glanced up at the TV at the bar and saw a fake NBA Countdown on ESPN, I felt like one of those people who get confused and think an article in The Onion is real. The Kobe Bryant scene was good on its own, but even better as the final joke in an episode where Rose gets clowned on by friends and colleagues for guarding Bryant in his 81-point game. (A rendering of a statue planned for outside the Lakers’ arena shows Rose cowering in fear of Bryant.) The segments in ESPN’s studios are staged and stilted—though Rachel Nichols gets a good bit—but the athlete cameos generally hit. For example: Rose runs into Larry Bird after a Pacers game. Bird offers him life advice that moves the plot along, then cajoles Rose into grabbing dinner. It turns out to be hot dogs at a Shania Twain concert at what looks like the state fair. (This is what gets the headline on the show’s fictionalized Deadspin.) A sitcom set in the sports world offers plenty of chances for cameos where athletes can play funny, caricatured versions of their personalities; that part probably could have worked. The rest of the pilot hit the usual sitcom beats; creator Khan is a vet. She also created Don’t Trust the B—— in Apartment 23, and has worked on everything from Pepper-Ann and Scooby-Doo to American Dad! and Malcolm in the Middle. But the “main character learns a life lesson” segment of Jalen vs. Everybody’s pilot is too saccharine—especially when Jalen’s son doesn’t really learn his lesson after getting in trouble for chasing girls on the schoolyard and trying to kiss them. I didn’t want to root for that stupid kid in more episodes! Jalen Rose Calls Chris Webber "Delusional"